My mission to Haiti is going to start soon. The objectives is to work with the CNSA in Port-au-Prince on communication issues: a new website, strengthening collaboration with FAO, developing partnership and networking with other institutions, effective use of the Fenix Workstation set-up by FAO. I’m very positive as the work has already started and we are building all the bricks, one after the other, with a clear perspective and a lot of enthusiasm. In the meanwhile, it is possible to read more about current activities, following the twitter account of Fenix in Haiti and seeing the photo gallery. Categories: news | Tags: CNSA, FAO, FENIX, food security, Haiti, mapping, photos | Permalink. I’m very happy to participate to the AMARC Africa’s 4th Pan African Conference! At the Conference, AMARC will gather its members, community radio stakeholders and relevant partner organizations to discuss the challenges of community radio in Africa. In his invitation, Marcelo Solervicens, Secretary General of AMARC, is eager to stimulate further collaboration between the major partners. In particular, the Conference will be an excellent opportunity to follow-up on the technical consultation workshop organized jointly in Rome last year on the theme of “Independent, Rural and Community Radios” being other partners like Dimitra and Farm Radio International also invited. My presence is intended to strengthen relationships with Radio broadcasters and the AMARC representatives in Africa and also to explore concrete possibilities to establish new partnerships in the field of rural radios. During the Conference it will be possible to learn more about habits, attitudes and needs of radio broadcasters in terms of: content needed, communication flows among members, computer literacy and use of ICTs. The information collected and the relationships created during the event will allow a deeper knowledge of the communication needs of the AMARC members and will help the knowledge sharing process among partners. the Past AMARC Pan African Conferences. Categories: events | Tags: Africa, AMARC, collaboration, communication, Cote d'Ivoire, development, dimitra, facilitation, FAO, Farm Radio International, knowledge sharing, mapping, people, radio, rural communication, rural radios, workshop | Permalink. It would be very nice if people knowing other projects would like to contribute to this mapping effort. Categories: news | Tags: cellphones, collaboration, collection, exercise, Forum on Mobile Telephony in Rural Areas, Google Maps, interaction, mapping, maps, mobile, projects, wireless technology | Permalink. 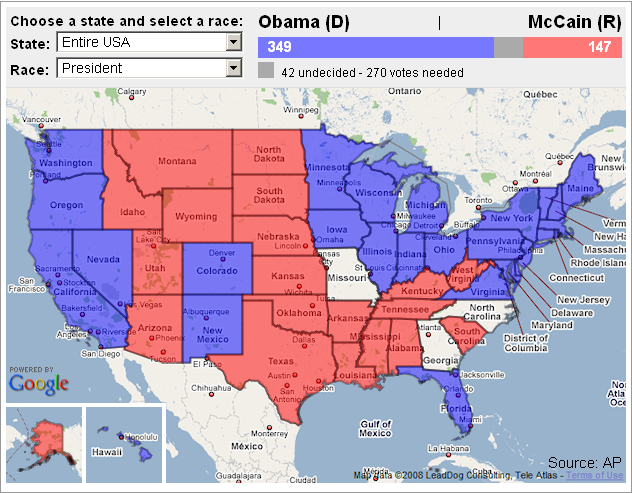 Categories: news | Tags: elections, Google, Google Maps, mapping, maps, Mc Cain, Obama, USA, voting | Permalink. The annual KM4DEV meeting just started in Lisboa today with a preliminary day dedicated to introductory activities about the group and the theme of KM. Read more in the km4dev 2008 meeting blog and more than that have a look at the pictures in the km4dev group on flickr. Pretty soon, some videos will be available as well. 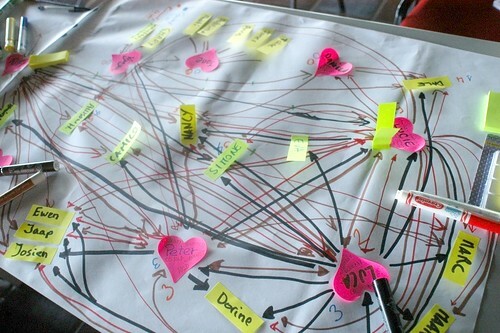 Network mapping was a very interesting activity we dedicated the whole afternoon. Time is passed to blog now but still you will find many interesting info about the vent in the pages I indicated. Otherwise, come back in a couple of days and more news will be available. Categories: events, km4dev, social media | Tags: capacity building, development, facilitation, km4dev, knowledge management, knowledge sharing, Lisboa, mapping, network | Permalink. Pc and mobile phone can easily go together. Take your desktop pc, add a small Bluetooth USB adapter (with a laptop you don’t need it), download the software from the site of the mobile phone company (if you have a Nokia as I have, you find it here), get the two devices connected! At this step you can start synchronizing data in the two devices. You have two options: an easy way if you just prefer to manage the mobile phone on the big screen and comfortable keyboard of your PC; or in a more sophisticate way, if you want to move up and down different kind of files. – on the other side, you can think about connecting the mobile to the Internet and distribute your material directly from the phone. To do that you need some software on your phone. Some example? You want to access your mail box on Gmail? Today you can with the Gmail application. You want to verify if the stock of products created by artisans you support have been sold already? Download the eBay client from here. 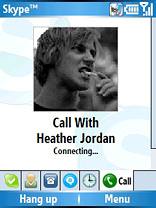 You need to chat and exchange files with partners? Use the Skype client for mobile devices. You want to verify your colleagues’ willingness for a meeting next Tuesday? Connect to the office common calendar and book the afternoon or check with the GMaps application where the meeting is. Categories: ideas, social media | Tags: capacity building, cellphones, communication, development, gmail, Google, Internet, knowledge sharing, lessons learned, mapping, mobile, Skype, software, support, technology, tools, web, wireless technology | Permalink. These days I see a lot of maps coming out of the Web. I suspect that, being so complex and full of millions of items, design and graphic art is the way to try to represent it at best. And, being myself a “visual” kind of person, I like this way to represent things more than others. and the main Online Communities at the moment. Categories: reports | Tags: champions, communication, facilitation, knowledge sharing, lessons learned, mapping, online communities, support, tools, www | Permalink.